Stealth GPS-4X Lite10Hz GPS Laptimer med INTERMEDIATES - IDEAL TID - GPS SPEED - TIMETÆLLER - omgangstider OG MAX HASTIGHED PER OMGANG DOWNLOAD til alle USB slags hukommelsespene. Med LITE modellen kan du stadig hente data over på din PC. Enkelte funktioner er frakoblet i LITE versionen. Det er dog muligt, at opgradere til en fuld version på et senere tidspunkt. NEW VERSION WITH DOUBLE CONSTELLATION GPS+GLONASS RECEIVER ALLOWING UNMATCHED PRECISION LEVELS, WITH SPECIAL BLUE SILICONE BUTTONS AND GASKETS FOR A FRIENDLY TOUCH AND EXTRA SEALING. FOR THE FINISH LINE AND INTERMEDIATES POSITIONING. With S.E.P.L.A. (Starlane Enhanced Precision Laptiming Algorithm) feature: a lap timing algorithm allowing very high lap timing precision levels. 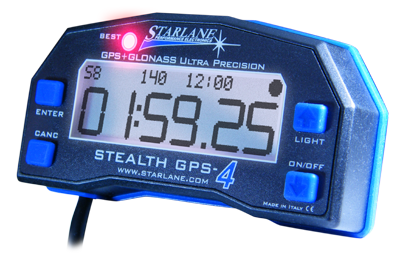 STEALTH GPS-4 LITE allows the lap times and max speed of every lap download directly on your USB pendrive, with this solution you can enjoy it without bringing your computer on the track area. Digirace-MMX software will automatically recognize your USB pendrive and the new sessions to be downloaded. Stealth GPS-4 Lite can be upgraded online to accudire the possibility to be connected to the optional CAN BUS expansion module that allows the acquisition from external sensors (eg. throttle, gear, RPM, etc. ), making your lap timer a data acquisition system. the Stealth shock-proof ABS body accommodates the new double constellation receiver which uses in symbiosis the american GPS and the russian GLONASS satellite systems. This solution increases dramatically the precision due to the vero high number of satellite involved in instantaneous position, speed, trajectory and lap time determination. the use of the GPS+GLONASS system intended to detect the lap time will make STEALTH GPS-4 LITE completely autonomous, requiring no beacon transmitters, such as the infrared ones used by old-generation systems. you can set up the coordinates of 4 trigger lines (main finish line + 3 optional intermediates). Whenever you cross a finish line or an intermediate, STEALTH GPS-4 LITE will indicate the relative split time and store its value. You can therefore quickly evaluate your own performance even if you are driving along a part of the track far from the main straight stretch, which would be expensive and unpractical if you used any other type of lap timer. by managing intermediates, STEALTH GPS-4 LITE can calculate the time a driver can ideally achieve for every single session. This function is obtained by adding the best sectorial times. This will help you understand the lap time you might have achieved if there had been no traffic in a specific point of the track or if you had done a lap on top of your absolute performance. the advantage of using a GPS+GLONASS system is also that you can measure the vehicle speed with the highest degree of accuracy without having to install any sensor on the vehicle. No user setup is required and, above all, any measurement is always accurate, not altered by the inclination of the vehicle or wheel spinning. STEALTH GPS-4 LITE has also got two hourmeters that can be separately reset for the periodical maintenance of the vehicle. Hour Meters are activated to receive the GPS speed signal. This solution can operate the hour Meters without any connection to vehicle harness. STEALTH GPS-4 LITE fits a wired USB socket, that can be easily positioned into the fairing, in which you can plug any USB flash memory. This solution makes the system totally free form the computer, at the end of the track day you will just need to plug the USB pendrive and Stealth GPS-4 LITE will download the acquired laptimes and maximum speeds for each lap, that will be then analyzed directly into the software Digirace-MMX. STEALTH GPS-4 LITE will automatically create a new session whenever you access the track. This means that you can analyse the times you have stored during the various sessions even at the end of the day without having to delete memory whenever you access the track. You can store the Date and Time of every single session as well as the total time, the intermediates, the maximum speed for every single lap. with STEALTH GPS-4 LITE you will never face memory full issues because,in order to allow a continuous usage, it manages the available space by erasing automatically the oldest sessions when the memory is almost full. this solution has provided for the development of a software unit that can analyse all stored data and set up all wished functions in an unequally user-friendly and immediate manner. The display is of a transflective type, which means maximum visibility also in the sunlight when backlighting is off. supplied by 12V vehicle battery or by optional cases for 9V batteries or optional batteries. Moreover, STEALTH GPS-4 is complete with powerful energy saving and self power-off functions the user can set up to make the best use of battery performance. It is supplied with a specific extension with eyelets for battery connection and with a connector on one side of the instrument for rapid disconnection. STEALTH GPS-4 is water resistant and it can also be used in case of rain. Cyclical memory management with automatic erasing of the oldest sessions. Supply: external vehicle 12Volts or optional 9Volts battery cases or optional batteries.